The Royal Society of Chemistry Twitter Poster Conferences are the biggest chemistry conferences ever organized as they are held entirely over Twitter. Chemists are invited to join this online conference by tweeting they poster, allowing people all over the word to share they research and engage with the scientific research community, without having to travel! The 4th RSC Twitter Poster Conference hold on Tuesday March 6th over 24 hours gathered almost 2 000 contributors and around 6 700 tweets for a total audience of over 2 million. This year conference featured all areas of the chemical sciences (analytical, chemical biology, education, engineering, environmental, inorganic, material, nanoscience, organic and physical). 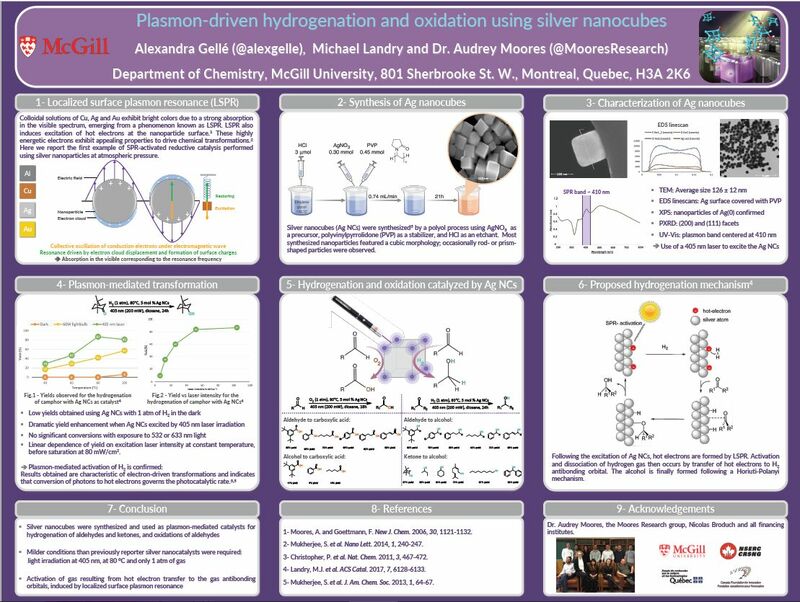 The jury awarded Alexandra Gellé from the Moores group first place in the #RSCNano category for her poster on plasmon-mediated reduction and oxidation reactions using silver nanocubes. The research was done in collaborations with Micheal Landry and Prof. Chris Barrett.